Hello everyone! Happy Chinese New Year! 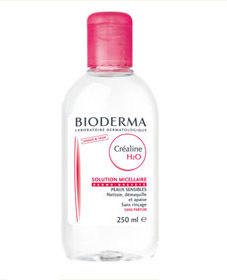 I am doing a simple review of an equally simple but amazingly effective product - the Bioderma Créaline H20. I first heard about this product when I was watching Lisa Eldridge's YouTube video, where she mentioned that this was her favourite makeup remover. Bioderma: At the cutting edge of innovation, BIODERMA has pioneered micellar solutions. Specially formulated for sensitive, normal to dry skins, the Créaline H2O micelle solution gently cleanses face and eyes. It removes water-resistant make-up.The micelles contained in its formula effectively micro-emulsify impurities while maintaining the skin’s balance (soap-free, physiological pH). I have been trialling this product for over a month now, and I love it! From the product descriptions and from meeting with the lovely Emilie, PR for Bioderma, I have noticed that the brand prides itself on its simple, no-fuss packaging, preferring instead to focus on the product itself. This product comes in a 250ml bottle with a pop on and off cap. What's special about this product is that the cover is not removable - this is to prevent refilling by dishonest resellers online. The product dispenses easily through the hole on top, and I've thrown this around in my makeup bag for travel a couple of times without experiencing any leaking or cracking. The product is a perfume-less, odourless liquid, not at all dissimilar to water. It works a treat when it comes to cleansing makeup. I do find that you need quite a bit of product to remove the kind of eye makeup that I wear, though, which makes me feel a little uncomfortable. I always feel like I need to get the best (and most) possible use out of my product, and when a particular product is being used up too quickly, I can get a little nervous. But that is just me being paranoid - I've been using this almost everyday for about 6 weeks now and I have only really used up 1/5th of the product. Bioderma delivers everything it promises with this product. It removes makeup (you need to go in twice with heavier eye makeup), cleanses the face, and is so gentle on the skin! One reason why I love this product so much is this - if you follow me on Twitter, you may have noticed me voicing my concern over the fact that I need to wash my face in the afternoons after I get back from work, but I also want to be able to wash my face at night before I go to bed, and this is unhealthy for the skin because cleansing 3 times a day is too harsh for the skin. This makes for the perfect solution! It is extremely gentle, and doesn't strip the skin at all! I have been using this together with my Ella Baché products, and they have worked extremely well for me so far! I have also been using this as a cleanser for my brushes. I add a little bit of rubbing alcohol, and a little bit of hair conditioner, and I mix them all together in a little spray bottle. It's been working a treat on my brushes - I'm so glad I've found a quick solution to cleansing my brushes in between makeup tutorials! If the Bioderma Créaline H20 sounds like something that you might be interested in checking out, look out for at your local Priceline, and at selected pharmacies. You won't regret it!